A dense cover of benthic invertebrates carpets the shallower rock surfaces of Cordell Bank. The abundant food supply of plankton drifting over the bank, combined with a hard surface for larvae to settle out and attach provide ideal conditions where space is a limiting factor. Invertebrate cover on the upper reef areas can exceed 100 percent as sponges, corals, sea squirts, anemones, and hydroids compete for space. More mobile invertebrate animals like decorator crabs, sea stars, sea cucumbers and snails move over and around this dense invertebrate carpet. The soft bottom habitats within the sanctuary also support a thriving community of benthic invertebrates. Adapted to life in and on a shifting habitat, these animals are either buried in the sediment, like polychaete worms and clams, or move around on the surface, such as sea stars and Dungeness crabs. The sea whip is one common soft bottom resident that extends into the water column providing structure and habitat for fishes and other invertebrates on the flat, mostly featureless bottom of the continental shelf. Thousands of swimming invertebrates make up a large component of the open ocean ecosystem of Cordell Bank National Marine Sanctuary. 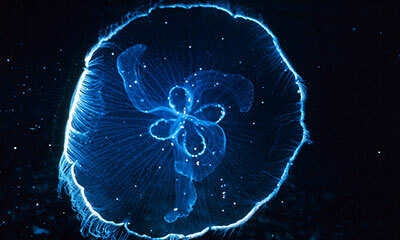 Among them are the gelatinous common jellyfish, moon jellies, and sea nettles, as well as the more obscure invertebrate creatures such as hydromedusae, ctenophores and siphonophores. The ocean sunfish and leatherback sea turtle, which visit the sanctuary in the late summer and fall, exclusively eat these gelatinous creatures and depend on them to survive. Jumbo squid (also known as Humboldt squid) are large invertebrates (up to 6 feet in length) that inhabit the waters of the sanctuary and are voracious predators. Small, shrimp-like crustaceans, known as krill, serve an important role in the sanctuary's food chain. Krill are referred to as "keystone" species because they are critical prey for so many other species on and around the bank. During the spring and summer, massive swarms of krill provide food for dominant species of the Cordell Bank ecosystem including seabirds, fishes and whales. 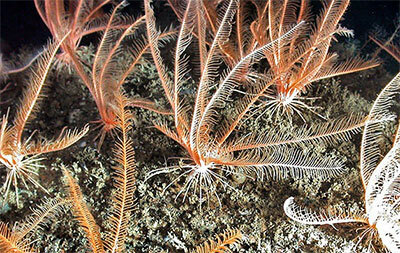 For more information on invertebrates within the open ocean, continental shelf, and deep sea habitats of Cordell Bank Sanctuary and the research being conducted on this topic, please visit the Sanctuary Integrated Monitoring Network (SIMoN).